You get your favourite seat, guaranteed! You can SAVE around 14% over single ticket prices! Can’t Make the Evening Shows? Try our Saturday Matinee Season’s Package! “8-12” is a simple, innovative program that is changing the culture of youth across the country! It’s a program designed specifically for students, and enables them to experience the performing arts for an affordable price. Are you a member of Theatre BC? Theatre BC Club Card holders receive a 10% discount on tickets. Want to reward great customers or top employees, or enjoy a night out with a group of friends? Use our group bonus! Buy 10 tickets, get one free! It’s that easy. 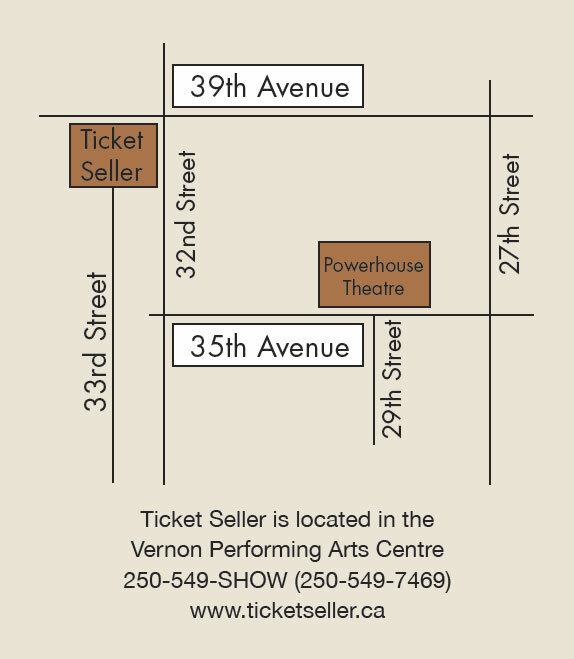 Tickets for Powerhouse can be purchased through Ticket Seller online, in person or over the phone. Tickets may also be available at the door, one hour before curtain.